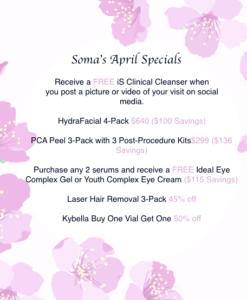 Amazing specials on HydraFacials, PCA Chemical Peels, Kybella, Laser Hair Removal, iS Clinical Products, and PCA Products. Purchases can be redeemed on any future date. **Specials cannot be used with any other discounts or promotions.